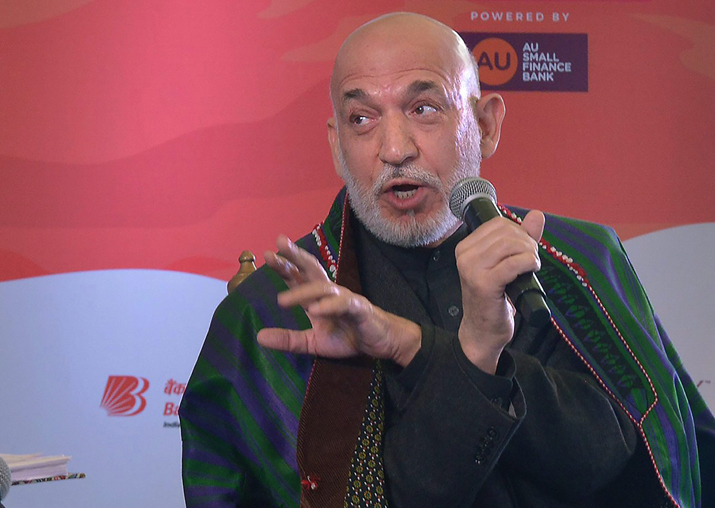 Responding to a question regarding being termed "anti-American", Hamid Karzai said that he was in fact opposed to the US way of dealing with insurgency that left the country hurt and destroyed. Supporting US President Donald Trump's tough stance against Pakistan on dealing with terrorism, former Afghanistan president Hamid Karzai today voiced hope that he will follow his words with action. Speaking at the ongoing Jaipur Literature Festival here, the Afghan leader even talked about his love for Bollywood films, music, and the Indian culture at large. Karzai said that actor Naseeruddin Shah would be the right person to play him if somebody plans to make a film about his life. Responding to a question regarding being termed "anti-American", Karzai, who was made the interim leader of Afghanistan in 2001 and became the first popularly elected president in 2004 following the fall of the Taliban, said that he was in fact opposed to the US way of dealing with insurgency that left the country hurt and destroyed. Asked about Trump's recent statements, he said, "It's one of the few sensible decisions that Trump has taken. We do support President Trump's statement on Pakistan's use of extremism and we hope that they will take action, that they will walk the talk this time." In a scathing attack on Pakistan, Trump had accused it of "lies and deceit" and of fooling US leaders while sheltering terrorists. He also suspended all security aid to the longtime US military ally. While speaking strongly against Pakistan's support to extremist forces, Karzai today stressed that he had nothing against the Pakistani people. "Yes, the insurgents were getting support from Pakistan, but they not from Pakistani people. The Pakistani people treated us equally like themselves, like brothers and sisters when we were refugees. My complaint is not to the Pakistani people. I love them just like I love Indian people. The complaint is with the military intelligence establishment there," he said. The former Afghanistan president was speaking at a session titled "The Great Survivor". He also spoke of factors that contributed to the rise of Al-Qaeda, saying it was a "very deliberate radicalisation for political gains" and that "Al-Qaeda wouldn't have happened without the support of the CIA". "Sometimes I am termed an anti-American. No, I am not. I am very pro-American, pro-western person. I am an eastern man without eastern attributes and qualities. My opposition to America was because they were hurting Afghanistan by bombing our country, by hitting our villagers, by taking our people prisoners. We were getting hurt, we were getting destroyed, that made me against the American policy," he said. He said there had been in the past "very deep cooperation" among the US, some western allies and Pakistan "when they tried to use religion to defeat the former Soviet Union". "And the Pakistanis and the Americans and some Gulf countries joined hands to use Islam. And the more they used it the more radicalised it became. Al Qaeda wouldn't have happened without the support of the CIA. It was them who did it. It was a very deliberate radicalisation for political gains," he alleged. He hoped Pakistan "would agree to peace" so that a dialogue could be initiated between the country and Taliban. On Bollywood and Indian culture, Karzai said, "I can possibly talk more about Dev Anand, Hema Malini, Zeenat Aman, Rafi, Mukesh than most people here. I have read Kalidas, Rabindranath Tagore and bought books on Mirza Ghalib's work during my visit to Khan Market in Delhi."